After a long day on the course, why not dine in our fabulous clubhouse restaurant. With a view overlooking the lake, it is a truly relaxing and enjoyable experience. With a well varied menu ranging from a great selection of carvery dishes such as Beef, Lamb, and delicious juicy Steaks to beautiful fresh fish dishes such as Salmon and Cod. Freshly made sandwiches and toasted sandwiches are always a popular choice, and with a great selection of fillings, you won't be disappointed. We also have a special menu just for the Kid's, with everything from chicken nuggets and chips to sausages beans & chips. We also have a selection of deserts and ice creams. Full bar and selection of wines is also available. There is a practise area at your disposal, and also a large 15 hole practise putting green. A shop to purchase refreshments such as soft drinks, chocolate, etc. The Caddy Master, where you can hire a caddy to supply you with information and distances of the course. The Pro shop, where you can purchase and hire clubs and Trolleys. They also stock clothing, golf balls, gloves, etc. Lesions are also available from our resident professional's. The flagship of our three courses, Killeen is truly one of the greatest courses in the country, at 6474 metres it will certainly challenge the longest of hitters, and with water on almost every hole accuracy is essential. Killeen played host to the Carroll's Irish Open in both 1991 and 1992, and proved to be a stern test for the Pro's. For the 1991 Carroll's Irish Open, only three players finished under par for the tournament. Killarney also hosted the Curtis Cup in 1996, where Great Britain & Ireland defeated the USA. 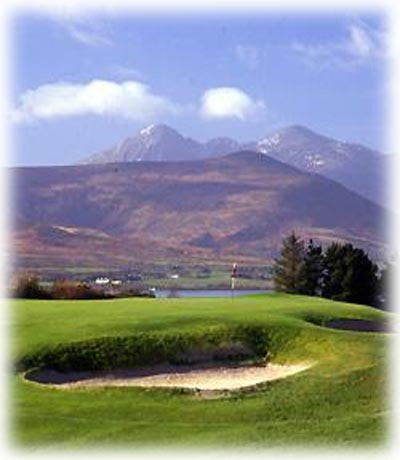 Golf has been played in Killarney since 1891, originally on a nine hole inland course. Then in 1930 it was expanded to an 18 hole course, the expansion brought the course to the lakeside and added outstanding beauty. Pictured here (above) the 18th, and signature hole of Mahony's Point a stunning par 3 over the lake. It measures 179 metres from the back tees, and with the wind coming in of the lake it usually plays even longer. This superb course situated beside the famous lakes of Killarney, is a good test for golfers of all skill levels. At 6164 metres it is the shortest of our three courses, but with with a combination of well undulated greens, well positioned bunkers and water hazards, wayward shots will often find big trouble. The latest addition to our Club, Lackabane is still in its infancy but is already proving to be quite a challenge. At 6410 metres it is of championship standards. The design is fantastic, with lakes and streams running through the course it adds to the beauty and also ads a lot of danger to crooked shots. The course is very different to Killeen and Mahony's Point, but has just as much to offer. I have played on many of the worlds finest courses in Asia, USA and Europe but none will surpass the beauty and tranquillity that Killarney Golf Course has to offer. Some of the most pleasurable golf experiences that one could imagine. Keep it up Killarney. Killeen at Killarney GC is an absolute must on any golf holiday to the Emerald Isle. It plays as a super mature mixture of park, wood and lakeland golf with some great views. All 18 holes are gems, particularly the first, a dog leg right par 4. The tee is on a small harbour wall hitting across onto the fairway, flanked by trees on the left and water all the way down on the right. At a glance the course appears quite open with fairly generous fairways and some of the biggest greens I've ever played on, fairly quick and it great shape too. But looks are deceiving as this course proves a real test, which you only realise when you finally add up the strokes on the 18th. The reception is warm and friendly at the clubhouse, at it is at most golf courses in Ireland, and the bar and meals were reasonably cheap. At 'a reasonable price' a round (Sep 98) it's well worth the money.